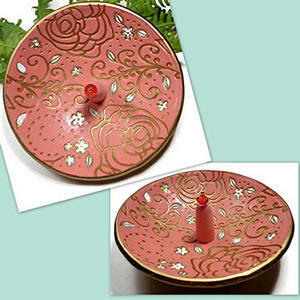 These beautiful ring holders will make sure you never lose a ring again! You know the drill – you get all dressed up for a night out, go to grab your favorite ring to top off your outfit… and it’s nowhere to be found. Sadly, rings are so easy to misplace – lucky for you, these ring holders below are here to save the day. Let me warn you — keep your credit cards away before we proceed — these ring holders are so cute you won’t be able to resist the urge to buy them all. 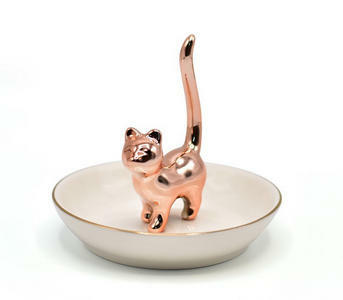 It doesn’t get much cuter than this rose gold cat. Crafted from great quality ceramic, this little kitty wants nothing more than to give you a helping hand by holding all your rings! The rose gold finish adds a fabulously chic vibe. It must be scientifically impossible to be in a bad mood while looking at an alpaca. They’re just so cute! 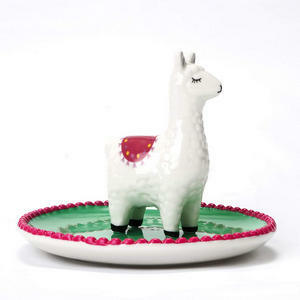 This sweet ring holder is no exception – adorable and practical? Count us in! 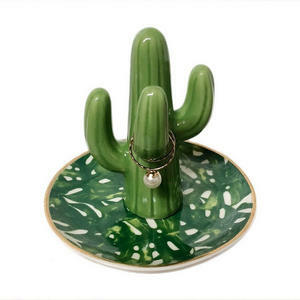 Show your love for all things prickly with this adorable cactus ring holder! It’s a beautiful green with sweet gold trim, making it will fit flawlessly into any decor theme and the best part? You can’t kill a ceramic cactus! 4. Kate Spade Ring Holder for wedding band. Beautiful and simple. 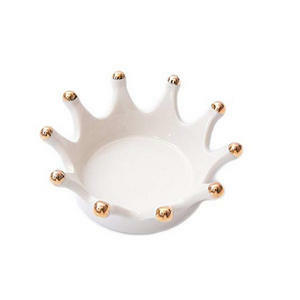 In classic Kate Spade New York style, this ring holder is guaranteed to bring a gorgeous, classy vibe into any room. 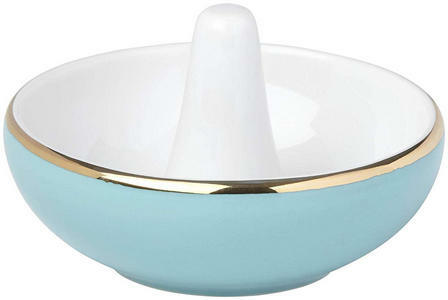 The lovely blue is perfectly balanced with a crisp white inside and finished off with a luxurious gold rim. Designed to look like a dainty drop of water hitting a lake surface, this lovely ring holder is equal parts functional and beautiful. The gold elements add a metallic finish to reflect the light – just as a real water droplet would. 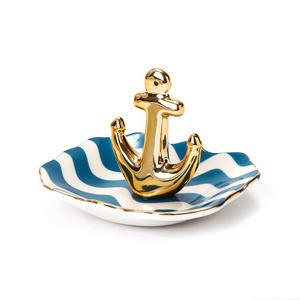 If your house leans towards a nautical vibe, this anchor ring holder is perfect! The stylish blue, white and gold color combo will add a little pop of color to any room, and the anchor design is ideal for hanging your special rings. Statement piece? Jewelry holder? Trinket tray? How about all three!? 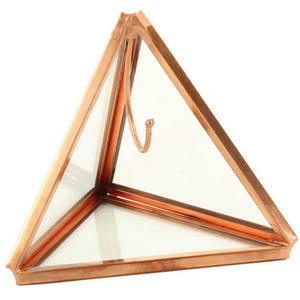 This rose gold and glass number is completely on-trend. 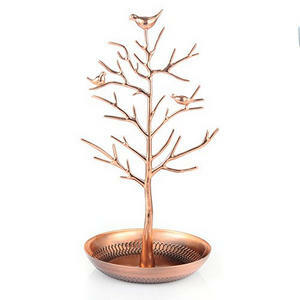 If you really want your ring holder to make a statement, consider this amazing tree piece. The delicate branches don’t just look gorgeous, they’re also totally practical for keeping all your rings separate, making them easier to find. Perhaps you have a ring collection to rival the rest of us and you need a touch more storage space – well look no further! 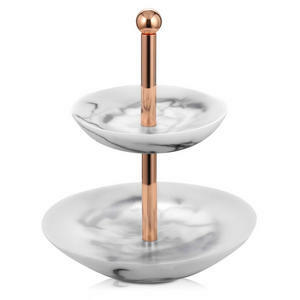 This amazing marble dish has two tiers to give you plenty of room for all your jewels. Whale whale whale, what do we have here? Perhaps the cutest ring holder we’ve ever seen! Whether you keep your rings on his tail or in his mouth, one thing is for sure – he’ll make sure they’re always easy to find. This little penguin is just waiting for you to add him to your home! 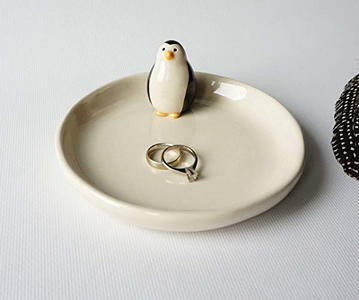 Each one of these cute penguin ring holders is handmade to order, giving them an extra-special unique vibe. 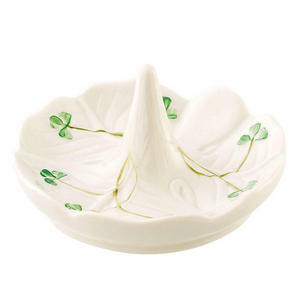 Add a lucky streak to your decor with this cute shamrock-themed ring holder. The white and green color combination is beautiful and rustic, and this special dish would be the perfect addition to any country bedroom. If you’re looking for something truly unique, this ring holder might just be it. Each one is painted by hand in a traditional Polish art style, so you’re guaranteed that no two will ever be exactly the same. 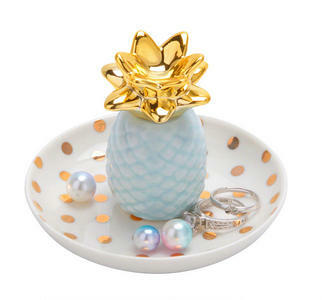 Pineapples are so very in right now, and this ring holder is just too lovely. The blue and gold combo is gorgeous, and the polka dots are a lovely addition. Pair that with high-quality craftsmanship and you’re onto a winner. Flowers lend their shapes perfectly to ring holders – the center makes a perfect trinket dish, and the petals are ideal for hanging your rings from. 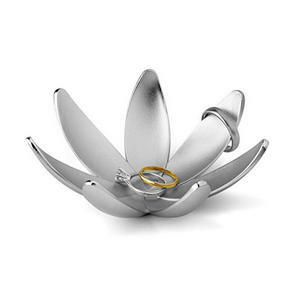 This chic chrome-plated finish makes this ring holder both stylish and functional. 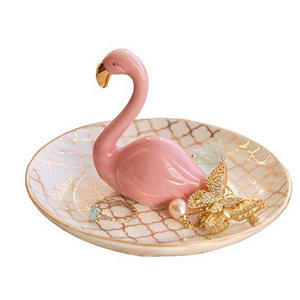 If you love all things pink, this flamingo ring holder will tick all the boxes. This holder is made with high-quality ceramic, and finished with adorable rose gold accents, making it the perfect eye-catching piece for your bedside table. 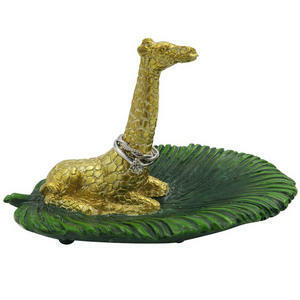 Add a real jungle vibe to your room with this funky gold giraffe ring holder! The whole piece is delicately etched and made from tough polyresin, so this savannah souvenir will be looking after your rings for a long time to come. It’s only natural for a ring holder to feature a hand on which to store your jewelry! A perfectly petite piece, this dish is not only groovy but super practical. Tell the world your true identity: a mermaid, obviously! We can totally picture this ring holder next to the bath, where you can splash around to your heart’s content. 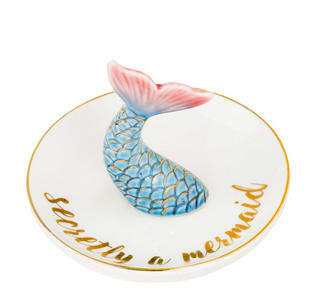 Perfect for any mermaid fan. We’re ending this list on a high note with this amazing peach-colored ring dish, complete with gold accents and a Swarovski crystal for extra bling. Everyone is bound to have serious ring envy! Now there’s no excuse for a misplaced piece of jewelry! Do you have a missing ring horror story? Let us know in the comments below!